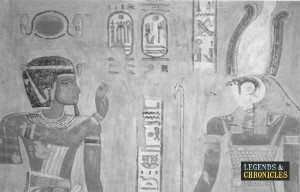 Ancient Egypt is generally considered to be among the oldest civilisations in the world and thus ancient Egyptian culture had a very long and rich history. The rise of ancient Egyptian culture can be dated back to 5500 BC as archaeologists have found the evidence of glass-work of faience from that era. It extends to 30 BC when Egypt finally became a province of Rome. Ancient Egypt is famous for its rich architecture, religious practices, and political system. Compared to other ancient civilisations of the time, the culture in ancient Egypt was fairly advanced for its time. Death had a particular religious and spiritual significance in ancient Egypt. The belief was that death is merely a transition and eventually dead people unite once again with their souls in the underworld. This religious belief was the cause of mummification in order to preserve the bodies of dead people which were to unite again with their souls. Again, due to this belief, it was common to bury clothes and food items with the dead as they might need them in the underworld. However, mummification was rather expensive and not everyone could afford it so only rich people and the Pharaohs were typically mummified. In ancient Egyptian culture, Hathor was a goddess who represented joy of life, humanity, and motherhood. She was among the most highly revered deities of ancient Egypt. The five gifts of Hathor were related to a ceremony when a person was inducted into the Cult of Hathor. During this ceremony, the priest or priestess raised the left hand of the person and asked them to name five things in life that they would miss if death took them at that instant. The five named things were then called the gifts of Hathor and the person was asked to remain grateful for those gifts in life. These five gifts of Hathor reminded people the blessings of gods in ancient Egyptian religion. Much of Egyptian culture was influenced by the Gods and the pharaohs like Ramses III and Horus depicted here. Gratitude for life and its blessings was a very important concept in ancient Egyptian culture. It was also made clear from the same ceremony of induction in the Cult of Hathor where a person was reminded of the five things in life for which he or she would feel gratitude. As long as a person retained his gratitude, he was considered free of sin. Ingratitude, on the other hand, was considered the “gateway sin” and resulted in negative thinking and bitterness. Since the Cult of Hathor was very popular in ancient Egypt, it shows the supreme importance of gratitude in that existed in Egypt at the time. Religion was a very important part of life in ancient Egypt. There were various core religious beliefs that remained more or less the same throughout many dynasties of ancient Egypt. For instance, one such belief was that the Pharaohs were the descendants of gods. Due to this belief, Pharaohs not only enjoyed the status of supreme political importance but were also considered the chief priests. Other important religious beliefs which played a significant part in ancient Egyptian culture include mummification of the dead, use of masks for various religious ceremonies, and a very peculiar belief about the afterlife. Just like religion, gods were of very high importance in Egyptian culture. The Egyptian religion was polytheistic and thus there were hundreds of gods and goddesses, although only a few dozen of them were of supreme importance. Many prayers and hymns have been found on the inside of tombs and pyramids which defined the relationship between the people and the gods. Every god was thought to have a special power and the representation of gods or goddesses was according to their special powers. Some of the most powerful gods in ancient Egypt include Ra, Horus, Isis, Amun, Aton, and others. Food, celebration and sport played a part in ancient Egypt too, with a Egyptian sport pictured here. Various cultural advances were made in the daily lives of Egyptian people over the course of centuries. For one thing, the architecture of ancient Egypt was refined over the centuries. Initially, step pyramids were built which were not very large but eventually the pyramids assumed a grand structure and other great temples began to be constructed as well. Actual advances in ancient Egyptian culture were made after the unification of Upper and Lower Egypt around 3150BC. It was after this that societal practices and political structure was clearly defined. Just like other ancient societies, strict class distinctions were maintained in Egyptian culture at the time. At the top of the hierarchy of classes were the Pharaohs and their royal families. Then came the aristocracy who exerted considerable influence on the affairs of the state. The class of priests and priestesses was also important in ancient Egypt and it enjoyed many privileges. Toward the lower end, there was the class of common people who indulged in trade or agriculture. Within this class, there were affluent as well as poor people. At the lowest rung of ancient Egypt society there was the class of slaves which hardly had any rights at all. Various sports and leisure activities were part of ancient Egyptian culture. Among the most important sports in ancient Egyptian culture, we can include handball, gymnastics, javelin throwing, fishing, boxing, weightlifting, high jump, tug of war, marathon, and others. Similarly, various leisure activities prevalent in ancient Egypt included hunting which other than the leisure aspect also provided food. Various activities such as board games including drawing, sketching, and swimming were popular. The Upper classes also indulged in parties and fine dining. Ancient Egyptian culture was a diverse and rich mixture of various dimensions such as architecture, religious practices, class structure, sports, and the political system. The architecture such as magnificent pyramids and grand temples was mainly derived from the religious beliefs of the time. The religious beliefs were polytheistic with unique concepts of death and afterlife. Ancient Egyptians celebrated life with the concept of gratitude associated with the Cult of Hathor. Society was divided into various classes with the upper classes enjoying the customary privileges. This class structure and social and religious practices remained intact till 30 BC when Egypt became a province of Rome.